The magical, invisible force known as electrical power is such a large part of our modern world that we may not give it much thought unless the lights don’t light, our toaster doesn’t toast, or our dryer doesn’t dry. We may think about it quite a lot when it comes time to pay the bill though! Anyway, since I have fielded a couple of electrical questions about breakers in the past few weeks, I thought I would share some things that I feel will help keep us all safer while working around them. First a little primer on how electricity gets to where it’s needed so that we are all on the same page. In very basic terms this magical invisible force is delivered from the electric company via wiring either overhead or buried underground. It enters our homes and workplaces via more wiring going to an electrical meter box. An attached meter then measures the power passing through it and records our usage. Directly after the meter box the wiring will go to one or more distribution boxes, known as a breaker box. The breaker box will usually have a main circuit breaker that the power is fed through whose function is to limit the total amount of current or amperage that can pass through it. This then feeds multiple smaller circuit breakers that limit the amperage that can travel through the wires, also known as branch circuits, which ultimately end up at the receptacles or light fixtures within the home or business. For the sake of simplicity, just try to think of amperage as a measure of how fast electricity is flowing. Flowing electricity always creates heat, the faster it flows the more heat is generated. If not somehow held in check when things go awry then all the downstream circuit wiring, and anything electrically connected to that wiring, can heat up and cause a fire. Circuit breakers are designed to allow the normal heat generated by an acceptable amount of current to pass through it. If that heat should exceed that due to an overload condition, then the breaker trips and that disconnects the power going through it. They will also trip when a very high current flow is detected in a very short period of time. When an appropriately sized circuit breaker is controlling an appropriately designed electrical circuit there is much less of a chance of fire or other damage to the system occurring. 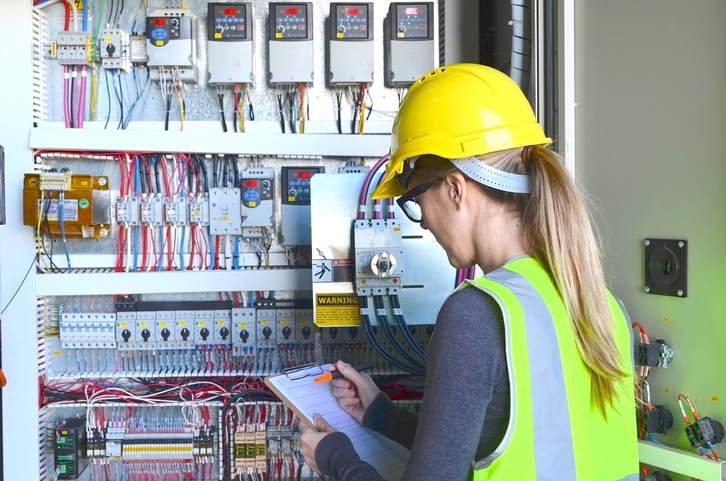 Therefore, whenever a circuit breaker has tripped, we have to see it as having done its job and we have to be more than a little curious as to why it needed to. In some cases, the cause is easily seen and corrected. Have you ever plugged in or turned on a space heater and had the computer on your desk, and those of your office mates nearby, go dark? Then you have caused an overload. You could go to the tripped breaker and reset that, but the breaker will most likely trip again very shortly if that is all that is done. Really, you will have to either refrain from using the space heater, turn off or unplug other electrical equipment using that circuit, or plug it into an entirely separate, less loaded, circuit. In other cases, it may not be as easy to determine a cause or maybe the breaker trips again immediately upon resetting. Warning! Never reset a breaker again if it trips immediately after the first attempt! This is usually due to a short and this is when we should engage a qualified individual to investigate it. This individual will know they will need to inspect several items prior to simply resetting it again. Some of the things they will look for prior to resetting is the number of devices plugged into the dead circuit. They will tally up the total amp draw of these devices, trying to determine if when all are running, would they exceed the circuit breaker’s rating. They will check the circuit breaker connections where they attach in the box and all wiring that they can at each affected receptacle or junction box. They will also most likely use an electrical meter to test certain things prior to reset and then once power is restored to verify that all is well. Another important item to remember in all of the above is that the circuit breaker is only designed to protect the electrical system components it feeds and the structures they are housed in. Beyond preventing a fire that could risk your life, they don’t provide you any protection against electrical shock or burns. Unless it is turned off and locked out, the power it will allow to pass is enough to kill multiple times over. It only takes between 0.100 – 0.200 of an amp to cause the heart to fibrillate (quiver) rather than provide the full squeeze necessary to pump blood. A typical 20 amp breaker found in nearly every breaker box passes 200 times that amount! Try not to become just a switch flipper. You should always investigate to determine why a circuit breaker has tripped and correct the cause first. If you don’t know how, call someone who is qualified. Never attempt to reset a circuit breaker should it trip immediately after the first attempt. Call someone who is qualified to investigate why it did. Should a main circuit breaker trip, always investigate the cause, and once determined and corrected, always turn off all branch circuit breakers prior to resetting the main. This reduces the chance that the large inrush of current will damage the electrical system, or prevent the breaker from resetting in the first place. Never increase the size of the circuit breaker to correct a reoccurring overload trip. The wiring itself can carry only so many amps before it overheats and possibly cause a fire. Breaker amperage ratings must be matched to the existing wiring gauge, or size, for the appropriate protection. Be very careful when you are looking for a tripped breaker in a breaker box. It is sometimes difficult to tell which one has tripped, but typically, the lever will be in the center or there might be an indicator window that will show red. It is also pretty easy to accidentally turn one that had been on to off and wiping out someone’s unsaved document on their computer. No one will ever appreciate that! We’ll continue our electrical safety talk next week, but feel free to reach out to me if you ever have specific safety issues or concerns. While I don’t have all the answers, I will always help to find someone that does. I hope that your week is productive and safe.